Part of the Gary Fisher Collection, the Tarpon is a hardtail mountain bike sporting the G2 Geometry which aims to improve handling. This bike handles really well because of its improvised geometry with increased fork offset. 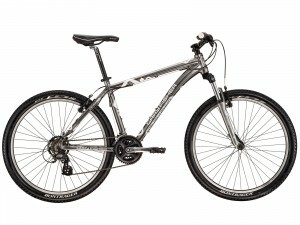 The only downside to the Tarpon is casual users may find it heavier than most hardtail mountain bikes. The price is relatively proportion to the bike’s good components. If you don’t mind having to use a heavy bike then this is a great bike over all. Get the best deal on the Gary Fisher Tarpon by using their dealer locator. This entry was posted in Gary Fisher, Mountain Bikes and tagged Gary Fisher, LDS mission bikes, mountain bikes, Tarpon. Bookmark the permalink.